Christian Security Institute™ (CSI) is a security training company that provides church security teams with formal security training. 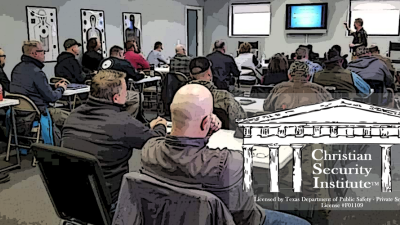 Classes training are held at our facilities in the Dallas, TX area and on-site training at churches across the U.S.
company. Gatekeepers provides churches with security services personnel through our church volunteer “Gatekeepers Program™”, contract security services, consultations and assessments. "Training the Called and Calling the Trained"
21 Zechariah son of Meshelemiah was Gatekeeper at the entrance of the Tent of Meeting. 22 All those chosen to be Gatekeeper at the thresholds were 212. They were enrolled by their genealogies in their villages [around Jerusalem], these men [whose grandfathers] David and Samuel the seer had appointed to their official duty. 23 So they and their sons were in charge of the gates of the house of the Lord, that is, the house of the tabernacle, as guards. 24 The gatekeepers were stationed on the four sides —on the east, west, north, and south. 25 Their relatives in their villages were to come in every seven days from time to time to be with them; 26 for these Levites, the four chief Gatekeepers, had an official duty, and were in charge of the chambers and treasuries of the house of God. 27 They spent the night around the house of God, for the [night] watch was theirs, and they were in charge of opening the house morning after morning.